and Rhode Island. Admirals Circle Award winner for exceptional customer service 19 years running! Cataumet Boats is one of the largest pre-owned & brokerage boats dealer for Cape Cod, Nantucket, Martha's Vineyard, Southeastern Massachusetts and Rhode Island. 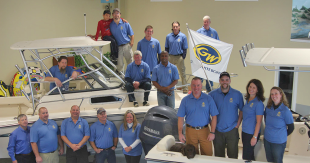 We have huge inventory of trade-ins and brokerage boats. Check out Pre-owned Boats inventory. 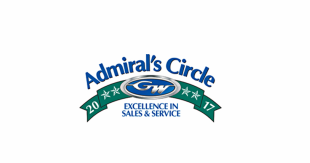 Cataumet Boats, Inc. was awarded the coveted membership in the Grady White Boats "Admiral Circle" for the 21st year in a row! Members of the Admiral's Circle have demonstrated an exceptional dedication to customer service earning at least a 9.25 on a customer satisfaction survey out of a maximum score of 10 on the index. When Pete and Rosann Way founded Cataumet Boats in 1959, their business plan was simple: offer only premium products, support the product with superior service and listen to the needs of the customer. The second generation at Cataumet Boats, Pete Way, Jr. and Sheila (Way) Giancola, remains focused on the philosophy behind the company's long-term success. 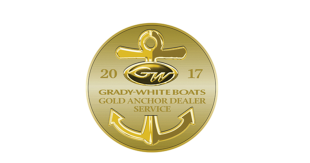 At Cataumet Boats earned Grady-White Boats' top sales award worldwide, the Gold Anchor Sales Award for 2017. The Gold Anchor Sales Award signifies that the overall rank of this dealer is the highest in sales dollars amongst all Grady-White dealerships. This is the sixth time Cataumet Boats has been awarded the Gold Anchor Sales Award - 2000, 2010, 2012, 2013, 2014, 2015 and 2017.